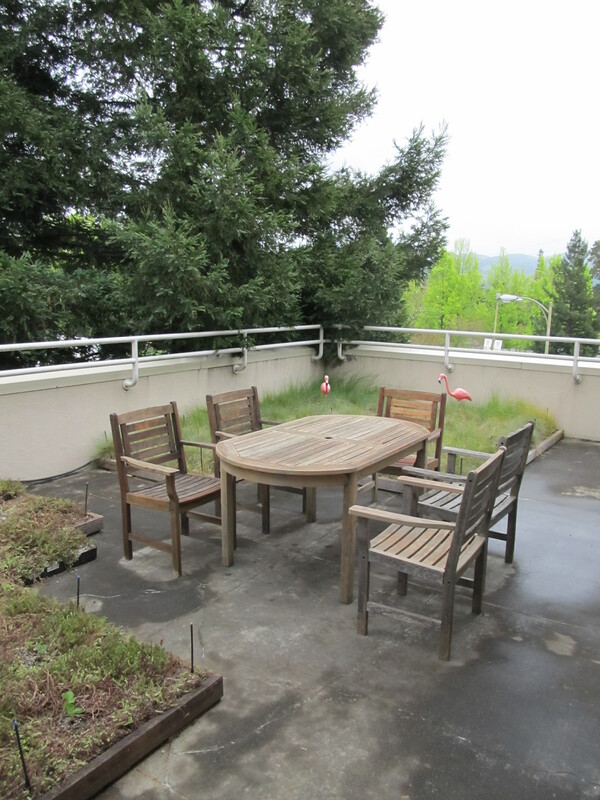 TLCD's newly refurbished green-roof deck. Last week in honor of Earth Day a few of us (Avian, Bridgett, Bill, Julie, Marina, Stephen, Jack and myself) got together to give our green-roof deck a bit of love. We gathered up the deck furniture, got out the sanders and went to work. If you heard something last Wednesday at lunch that sounded like 10,000 angry hornets descending on TLCD, that was us. While some of us sanded off years of sun-baked slivers, others cleaned out the detritus that had accumulated on the green-roofs. In addition to a general clean, we decided to add some new plants to the roof. What was once a green-roof is now an eatable green-roof! Amongst the native grasses and sedums you will now find strawberries, lettuce, basil and tomatoes. It’s an experiment to find out what can be grown on a living roof. Thanks to all who joined in and helped. Now get out there and enjoy a nice break or lunch on the deck.